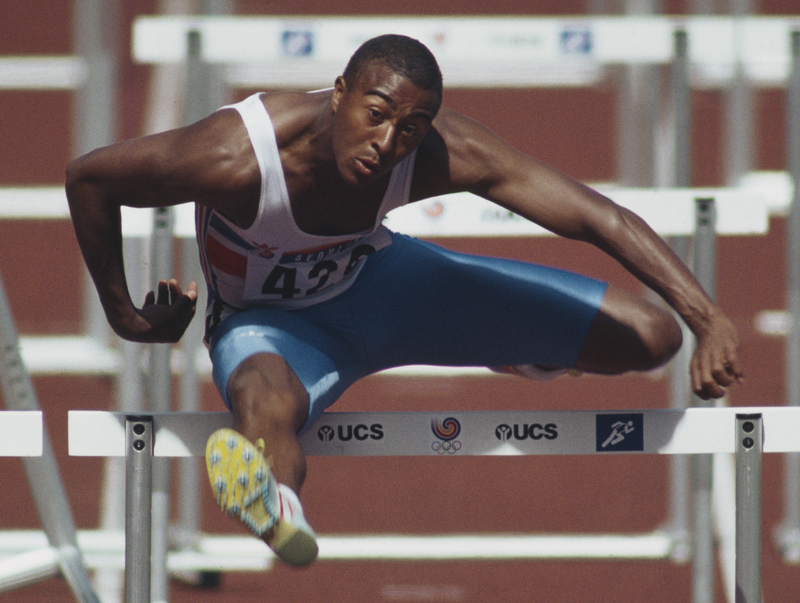 Colin Jackson dominated sprint hurdling for over a decade. At his peak, the Welshman was untouchable. Quick off the blocks and an expert ‘on the dip’, during races, he was aggressive onto the hurdles and balletic between them. He was double World Champion, four-time European Champion, twice Commonwealth Champion, and competed at four Olympics, winning silver at Seoul 1988. Over the 60m hurdles, no-one has ever gone faster. Not bad for someone who considered himself ‘naturally more talented’ at table tennis, whose first event was the decathlon, and who later wanted to do long jump. But athletics was very much his calling. After catching the eye by winning Olympic 110m hurdles silver in 1988, as a fleet-footed starlet, he won his first major gold at the European Indoor Championships in the Hague. Jackson’s performance in the Netherlands was an eye-catching display of trademark speed and graceful co-ordination. He qualified quickest of all the athletes in his heat, as well as leading the way in the semi-finals, with times of 7.66 and 7.53 respectively. Jackson lined up against then reigning champion Ales Hoffer of Czechoslovakia, as well as young German Florian Schwarthoff, who would go on to win Olympic bronze in 1996. But leaving the rest trailing in his wake, he powered clear to win in 7.59 ahead of East Germany’s Holger Pohland and Frenchman Philippe Tourret. This kickstarted a hugely successful career entering the 1992 Barcelona Olympics as favourite for the 110-metre hurdles, having won 110m Commonwealth and European gold in 1990. However in the final, hamstrung by injury, he uncharacteristically hit four hurdles before watching training partner Mark McKoy strike gold. In 1993, he bounced back to become World Champion in Stuttgart, helped the 4×100 relay team to silver and was named IAAF Male Athlete of the Year for good measure. A week later began the scarcely believable 529-day unbeaten run which saw him claim victory in 44 consecutive races. During this hot streak, in 1994, he gained double European Indoor Championship gold in Paris, a week earlier running 7.30 in the 60m hurdles in Germany – to this day, the fastest in history. Jackson pipped Greek Alexandros Terzian to the 60m sprint crown, with fellow Brit Michael Rosswess third, and the following day, he breezed to 60m hudles glory with a searing time of 7.41, well ahead of nearest challenger, Romania’s Gheorghe Boroi (7.57). Five years later, he became double World Champion, becoming the first Brit to regain a World title, demonstrating what coach Malcolm Arnold called a “natural psychological strength”. In 2002, he continued his 12-year streak at the Europeans, earning a fourth successive gold, finally hanging up his spikes the following year. After retiring, Jackson coached several British sportsmen, contributed heavily to the London 2012 Olympic bid and commentates regularly for the BBC. He was awarded a CBE in 2003.